Authors note: In sanskrit, “Guru” refers to a spiritual teacher who leads a willing student to the realization of their true nature. 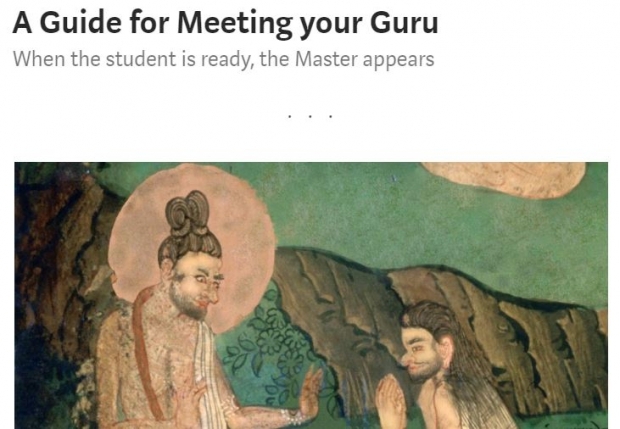 This article uses the terms “Guru” and “Teacher” interchangeably. There are numerous stories from spiritual lore of the fated encounters between Guru and Disciple — many aspirants on the spiritual path hunger to one day meet their guru. But the journey it takes to prepare us to recognize and follow an authentic Guru cannot be planned. We must walk the journey for it to become our own. After my initial mini-awakening through love, heartbreak and exposure to Eastern philosophy, the pursuit of the Divine became the primary interest in my life. I was deeply drawn to the biographies of enlightened mystics and sages like Buddha, Jesus, Osho, Amma, Ramakrishna, Yogananda, Rumi, Nanak and others (all who became my heroes and invisible friends). I looked for clues as to how they realized God; practices or a way of life I could imitate, seeking inspiration while making comparisons with my own life to figure out where I was on the path towards enlightenment.